We have been open now for three months and have had the pleasure of meeting and dealing with some great people, across the entire country. Supplying all sorts of cars, finance and buying advice to new car buyers and next car buyers – we’ve even made a few dreams a reality along the way. All in all, a brilliant start! 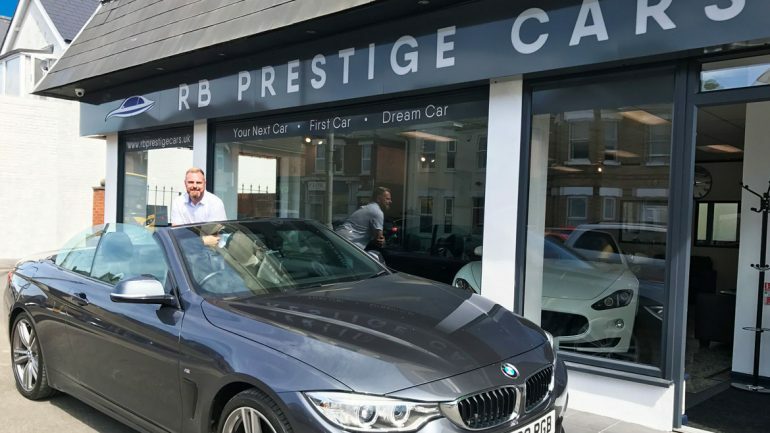 It is surprising how many people don’t realise that I was co-owner of a successful car supplier to footballers and celebrities until recently, and my passion was to just get back to delivering the best service to everyone…hence RB Prestige; prestige service to all. From Campers to Cambiocorsas, Peugeot to Porsche and even the odd motorbike – from any era – it has been amazing to just get back to enjoying the motor trade and providing the best possible service that we can. It’s ok to have some fun on the way and you would have laughed too if you could have seen me crammed into the middle of a bench seat of a Dodge Ram for a test drive, or that time trying out the back seat of a Ford KA. Customers watching through the window of the showroom, being waved in to direct me as I shuffle the cars around and get stuck in the driver’s side against a wall. Life is serious enough and buying a car is an extremely important business. But, as long as we can welcome the world, deal professionally, whilst have some fun along the way – making someone’s day just a little better – does that really make it uncool? I don’t think so. I have a huge passion for the motor trade, cars and everyone associated with it. Genuine car suppliers and buyers have provided me with some of my greatest memories. Now, through RB Prestige (and god willing enough to cover the cost of having a family I am so proud of), I want to give something back. Our modest showroom and overheads only mean that we can offer the most competitive pricing and we don’t need to charge ridiculous premiums just to light the place. The small, but excellent team here covers all your needs personally and with care. Not just with the purchase itself, but continuing well into the future. We help with servicing, taxing, cleaning and hopefully changing your car once again in a few years. If you want a Ferrari, I’ll get you a Ferrari, but I will proudly always have the other stock around me because that is the essence of RB Prestige. If it has four wheels and you want to buy it, look at it, or just talk about it, then our showroom is open to all for coffee and a warm welcome. If you happen to buy from us then we are humbled and grateful for that too. Going back to supplying cars the old fashioned, honest and family way. Come and see us on Ashley Road and step into the best kept secret in buying your first car, next car or dream car.